At Thrive Global, since our mission is to end the epidemic of stress and burnout by changing the way we work and live, we have to be deeply committed to the idea of behavior change, at both the individual and societal level. It’s a big goal. And we know the way to get there is not in huge, giant leaps, but in very small steps. We call them Microsteps, and they’re the foundation of our behavior change platform. They’re small, actionable, incremental, and science-backed steps we can take to make immediate changes in our daily lives. And to start off the New Year in the right direction — and support all of you who are trying to take advantage of the “fresh start” effect — we’re declaring January Microstep Month. All month long, we’ll be featuring Microstep Diaries from Thrive staffers who will share their experiences of trying one Microstep for 32 days, along with the changes in their lives, both large and small, that result. And each Tuesday we’ll be sending our Thrive newsletter subscribers one Microstep to try, along with helpful expert advice on how to make your habit-change goals for 2109 a reality. Because we know what happens when we start off too big. Too many people try to change their lives through sheer willpower, simply deciding to make major changes and then feeling guilty when, inevitably, their daily habits don’t all follow along with the new directive from the top. If habit change were this easy, we wouldn’t need to make changes in the first place because we’d have no bad habits. Microsteps are about making changes that are too small to fail. It’s about meeting you where you are. It’s not that we can’t get to where we want to go — we can, but we can’t just magically teleport there by declaring that’s where we want to be. Over a long journey, however, making even very small changes in the trajectory can lead us to a very different destination. Microsteps are the building blocks of habits. Over time they accrue, and become new habits, which in turn become healthier and more thriving lives. One of the ways Clear puts that principle into action is with his “two minute rule,” which, for example can mean working up to a goal of reading a book a month by starting with just one page a day. He tells the story of a man who went to the gym and worked out for only a couple of minutes a day. But by doing that, Clear says, he gradually became “the type of person who works out every day” — a goal that the man would have been less likely to reach had he decided, as a lot of people likely have this week, to hit the gym for an hour a day. The solution is to go upstream, to focus on the habits that fuel stress and burnout. And the solution for that is Microsteps, the simplest way to take action and build life-sustaining habits. 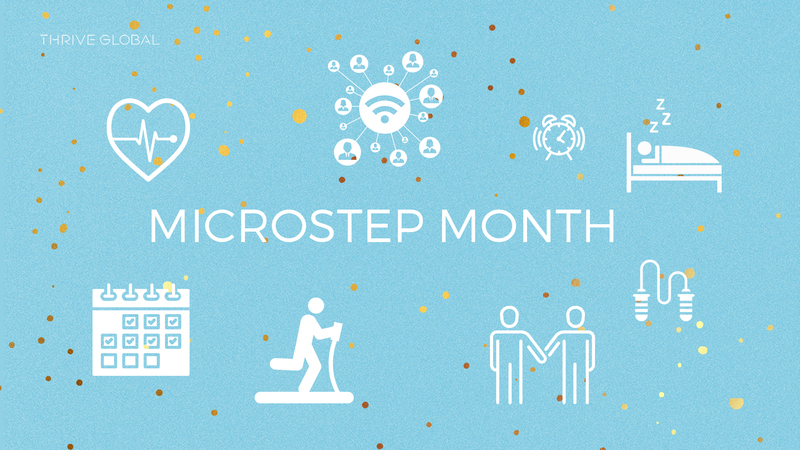 So I hope you’ll join us for Microstep Month. As our Microstep Diaries show, we don’t just talk about Microsteps, we live them. For example, here’s Thrive Global Assistant Editor Rebecca Muller on what happened when she tried tidying up every night before bed for 32 days. There’s also our Director of Branded Content Summer Borowski on the lessons she learned from journaling every night. And Gregory Beyer, our Head of Corporate Content, shares how doing a short burst of exercise each morning helped him thrive. To sign up for our newsletter to receive a new Microstep each Tuesday, you can go here. As Robert Collier wrote, “success is the sum of small efforts, repeated day in and day out.” Here’s to a happy, successful and thriving 2019 — one Microstep at a time.